For the state constituency represented in the Sarawak State Legislative Assembly, see Belaga (state constituency). Belaga is a district in Kapit Division, Sarawak, Malaysia. It is located on the upper reaches of the Rajang River, some 120 kilometers northeast of Kapit as the crow flies but considerably further on the river and slightly less than 100 kilometers from the South China Sea coast near Bintulu. It is located within the Hulu Rajang parliamentary constituency. The district population as of 2010 was 37,102 while the area of the district is 19,403.2km². Belaga was established in the early 1900s when a few Chinese traders set up shops and started trading with the Orang Ulu, supplying essentials such as kerosene, salt and manufactured goods. Belaga is set beside low forested hills that descend to the river. Walk along the river, past the Malay Kampung where most of Belaga's Malay residents live. There are lots of interesting fruit trees. Try to spot the tribal burial sites on the other side of the river that are decorated with carved wooden archways, which have been placed there by the local Kayan tribal people. On the outskirts of Belaga Town. To the north is a massive dam project, the Bakun Dam, which is the largest dam in Asia outside of China. 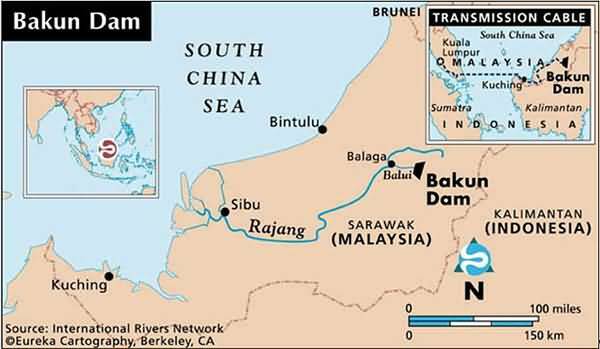 The dam was intended to provide electricity for Sarawak, other surrounding regions and Peninsular Malaysia, but its construction was delayed several times due to economic circumstances, in particular the Asian Financial Crisis of 1997. The federal government decided to continue the project, as billions of ringgit had already been spent on it. However, during the early implementation stage of the construction the plan was scaled down in order to reduce cost. Nevertheless, in January 2007, the Malaysian federal government announced its intention to reactivate the initial plan to transfer the power generated by the dam to Peninsular Malaysia via a submarine power cable. The submarine cable will span a distance of 670 kilometres and reach the shore of Peninsular Malaysia at Yong Peng, at the state of Johor, southeastern part of the peninsula. It is expected to be completed the earliest by 2012. Before flowing through the submarine cable, the electricity will flow from Bakun to the western tip of Sarawak via over head electric transmission cables traversing a distance of 700 kilometres. The additional project is expected to cost between RM9 billion and RM10 billions. The dam has been accused of uprooting 11,000 Orang Ulu from their traditional homes, clear-cutting hundred of square kilometers of ancient virgin tropical rainforest with consequent losses of hundreds of endangered plants and endangered animals, and forever changing the natural environment of Sarawak. Wikivoyage has a travel guide for Belaga. ^ "Laporan Kiraan Permulaan 2010". Jabatan Perangkaan Malaysia. p. iv. Archived from the original on July 8, 2011. Retrieved 2011-01-24. ^ Map Archived 2011-07-27 at the Wayback Machine of the dam location.